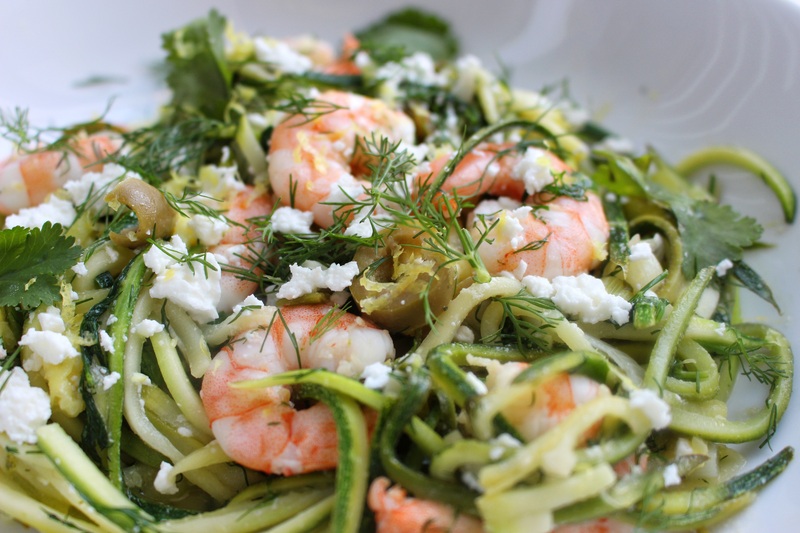 Prawn, feta and lemon courgetti | dash.drizzle.dollop.devour. The lure of a new kitchen gadget can prove hard to resist. I’ve been toying with the idea of getting a spiraliser for a while now; there is something very appealing about swapping the carbs for something a little bit lighter, especially in summer. Until I have a massive kitchen with oodles of storage, I try not to act on impulse and commit my already bulging cupboards to yet another gadget, however exciting it might seem. So in an attempt to work out whether long thin strands of vegetables will indeed prove to be a total revelation to my cooking, I bought a significantly smaller, cheaper julienne peeler instead, which can live comfortably and guilt-free in the utensil drawer. Prawns and feta are one of my favourite flavour combinations – the tangy, salty cheese sits perfectly alongside the sweet, meaty prawns. Handfuls of herbs and some lemon zest make this taste like a summer evening by the seaside. I’m normally an advocate of chopping ingredients as you cook, but this is one dish where it’s worth getting everything ready before you turn the pan on. The skinny strands of courgette barely need 1 minute to cook, so the whole dish only really needs 3 minutes in the pan. I used 8 frozen uncooked prawns, one of my freezer staples, so if you are also using frozen prawns, start by defrosting them. Next prepare the vegetables. Trim and finely slice 3 spring onions. Finely chop 1 clove of garlic. Then create your strips of courgette with whichever gadget has found its way into your kitchen. I found it easiest to leave the stalky end on the courgettes to give me a handle to grip onto and then drag the peeler down the length of the courgette. I thought 2 full courgettes might be excessive for just me but it turned out to be just the right amount. Chop a good handful of dill and a smaller quantity of coriander. Pit and slice a few green olives. Have a chunk of feta cheese, a lemon and a zester to hand. Warm a generous drizzle of olive oil in a large frying pan over a medium-low heat. You want a pan with a big surface area so the vegetables cook evenly and don’t start to steam and go mushy. Add the spring onions and garlic and allow to soften for a minute. Add the prawns and stir for 30 seconds until they are partly pink. Add the courgettes and stir for a minute or so until they just begin to soften. Grate in the zest of half a lemon and then squeeze over the juice. Scatter on the herbs, a little black pepper and crumble over the feta cheese and that’s it. Serve immediately. I think some chilli would also work nicely in this if you would like a bit of spice. Absolutely delicious ~ Thank You Anna! Axel made your Prawn, feta and lemon courgetti while we were staying with friends in Anglesey. We all enjoyed it and will definitely be making it again!